We would like to thank Looney Labs for the review copy of Mad Libs The Game used for this review. Other than receiving the review copy we at Geeky Hobbies received no other compensation. Receiving the review copy had no impact on the content of this review or the final score. Deal seven word cards to every player. Shuffle the sentence cards and place them in the center of the table to form a draw pile. Reveal New Sentence Card: Flip over the top card from the sentence deck and read the sentence aloud. Choose Your Words: Each player looks through their cards to determine which card they will use for each blank on the sentence card. The word cards chosen have to have the appropriate type of words to fill in the blanks. For example if an adjective is needed a card with an adjective on it must be played. If you can think of another form of the word on the card you can use it if you can convince the other players to allow you to. The cards chosen are placed face down on the table. If a player doesn’t have the right cards to fill in the whole sentence, they draw additional cards until they have enough of the required words to fill in the sentence. Reveal Sentences: Player reveal their cards and say their sentences out loud. Vote: Players decide which sentence they felt was best. Each player has to vote for one of the sentences other than their own. On the count of three all of the players point at the person that they felt created the best sentence. The player who got the most votes takes the sentence card to indicate they won the round. If two or more players tie, each of the tied players get a sentence card. If all of the players tie, no one gets a card. Here is an example of a sentence created for this sentence card: Ahoy, “fool”! Welcome aboard the most “flimsy” pirate ship ever to “defy” the seven “puppies”. When the round ends all word cards used in the round are discarded. Players can choose to discard any other cards from their hand that they want to discard. Players then draw back up to seven cards. 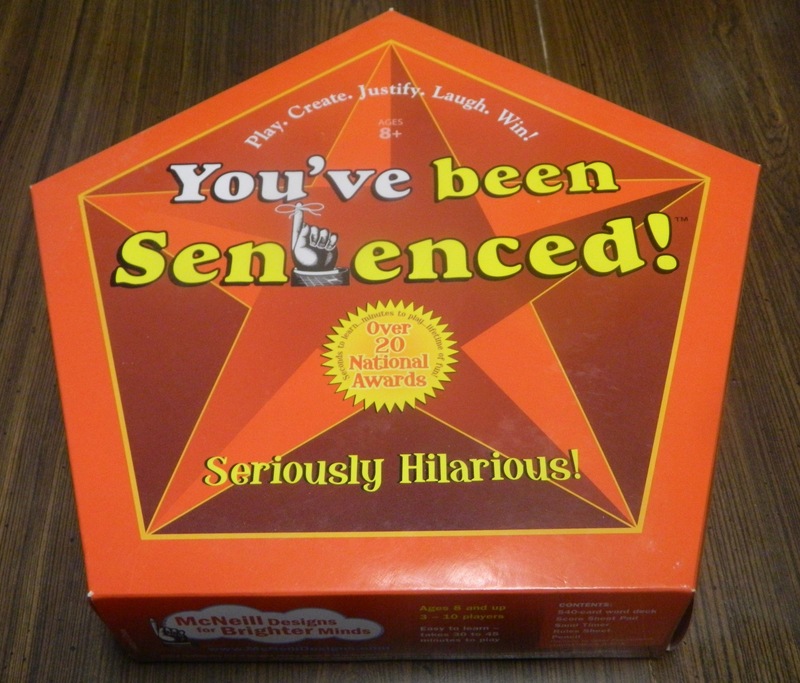 The first player to get three sentence cards, wins the game. If two people reach three sentence cards at the same time, the first player to reach four sentence cards wins the game. Created in 1953 by Leonard Stern and Roger Price, Mad Libs have been a popular series of books in the United States selling over 100 million copies (Wikipedia). For those not familiar with the series the basic premise is to make funny sayings/stories by filling in blanks with random words. With the popularity of games like Apples to Apples it should come as no surprise that Mad Libs would be made into a board/card game. While there have been a couple Mad Libs games made in the past, they haven’t done particularly well with pretty poor ratings on Board Game Geek. Looney Labs, makers of games like Flux, have just released their own version of a Mad Libs card game. 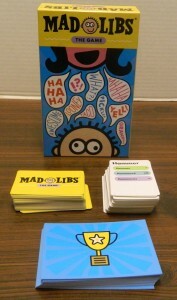 While not perfect, Mad Libs The Game is probably the best Mad Libs card game that you are ever going to find. Mad Libs The Game is a family/party game. It is not a highly strategic game so people that love strategy games probably won’t like it. Basically if you like games like Apples to Apples I think you will enjoy the game. The game is probably going to play best in family/party situations since it is meant to be more of an experience to have fun than a game that you are going to play competitively to try and win. The game is recommended for ages 10+ and that seems accurate. The game is pretty easy to play so kids with strong reading skills under the age of ten could probably play the game. The game doesn’t have anything that would be inappropriate for children so the age recommendation seems to mostly be due to the required reading skills for the game. The game has an estimated playtime of around 20-40 minutes but I would say it is closer to the 20 minute side unless you play with a lot of players. With only four players the game will likely only take around 20 minutes since the winner only has to win three sentence cards in order to win the game. Mad Libs The Game works really well if you are looking for a pretty short game that you don’t have to put a lot of thought into playing. If you want a longer game you can just make players have to get more than three cards to win or you could even play multiple games. Mad Libs has a lot of flexibility depending on how long you want to play the game. 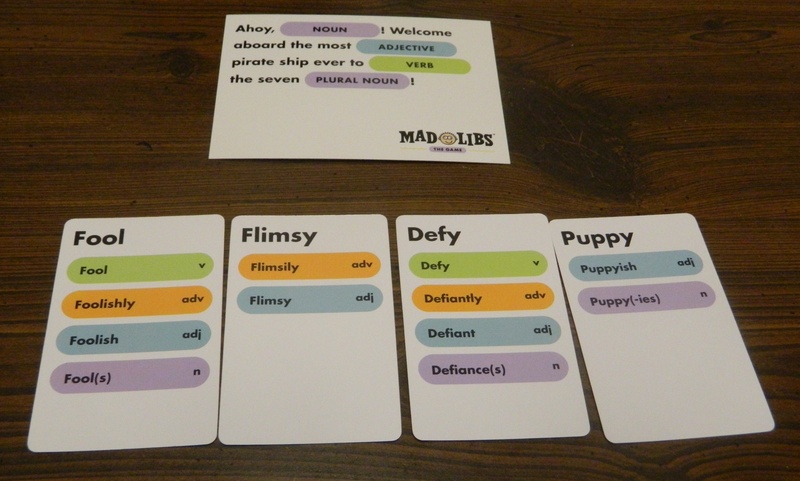 Mad Libs The Game is going to be best if you play the game with more creative players. If you play the game with a lot of players that aren’t creative or don’t want to be creative I could see the game being dull. The game isn’t going to be that fun if you take the game seriously. The game is good because of the wackiness/randomness. You aren’t going to get the necessary words to make a good/wise saying so you want to try to make a funny sentence. You most likely will end up making sayings like: Don’t make a/an “drink” out of a/an “pizza”. While Mad Libs The Game shares a lot in common with games like Apples to Apples, there are some things that keep Mad Libs from being as good as Apples to Apples. I actually like the premise behind Mad Libs more than Apples to Apples. In Apples to Apples you just play a card that reminds you most of the current round’s topic. In Mad Libs you actually get to form a whole sentence. This presents a better opportunity to add humor to the game and actually requires a lot more creativity than Apples to Apples. In some cases this works and you can have more fun with Mad Libs than Apples to Apples. The problem is that since you are required to play more cards per turn, it is much harder to actually play cards that make a cohesive sentence. You will encounter situations where you have the necessary cards to finish the sentence but they don’t make any sense being played together with the rest of the sentence. You essentially have to forfeit these rounds unless your group finds random sentences that make no sense funny. This is a problem that is prevalent in all of these type of games that require players to play more than one card each round. While I don’t think Mad Libs The Game is quite as good as Apples to Apples, there are some areas where I actually think it is better. First each card gives you a lot more variety. I like that each card gives multiple versions of the word which allows you to play the game in several different ways. The game really wouldn’t have worked if this wasn’t added. The other rule I really like is that at the end of any round you can discard any card(s) you want and draw a new card(s). I like this rule because in most of these games you get stuck with cards you can’t use and end up throwing away a round just getting rid of them. The biggest problem I had with Mad Libs The Game is a problem that is prevalent in most of these type of games. While the game includes 200 word cards and 42 sentence cards, I wish more cards would have been included with the game. I didn’t have much of a problem with the sentence cards. Obviously it would have been better if there were more of them but they will last quite a while and you should be able to replay them without much of an issue since the sentences you form with them each time should differ quite a bit. The bigger problem is with the word cards. 200 cards is a decent amount. The problem is that you use so many of the cards in one game that you will have to use repeat cards quite quickly. You can form a lot of different sentences with the cards based on which cards you have in your hand but it gets a little repetitive having to play the same cards over and over again. I hope in the future that Looney Labs creates some expansion packs for Mad Libs which include additional cards in order to expand the game and add more variety to the words included in the game. While waiting for expansion packs, players can make their own cards pretty easily. For the word cards you could use index cards and create your own cards by finding words that fit multiple different parts of speech. While I wish the game had more cards, the components are otherwise good. The cards don’t have a lot of artwork but they still look nice. The cards are designed well especially the sentence cards. Each sentence card uses colored ovals to indicate where words have to be added to the sentence. These colored ovals refer to the words on the cards so you can quickly tell which word on a card can be used in a particular section of the sentence card. This makes it easy to see your different options for a given sentence. Mad Libs The Game is probably the best Mad Libs game we are ever going to get. 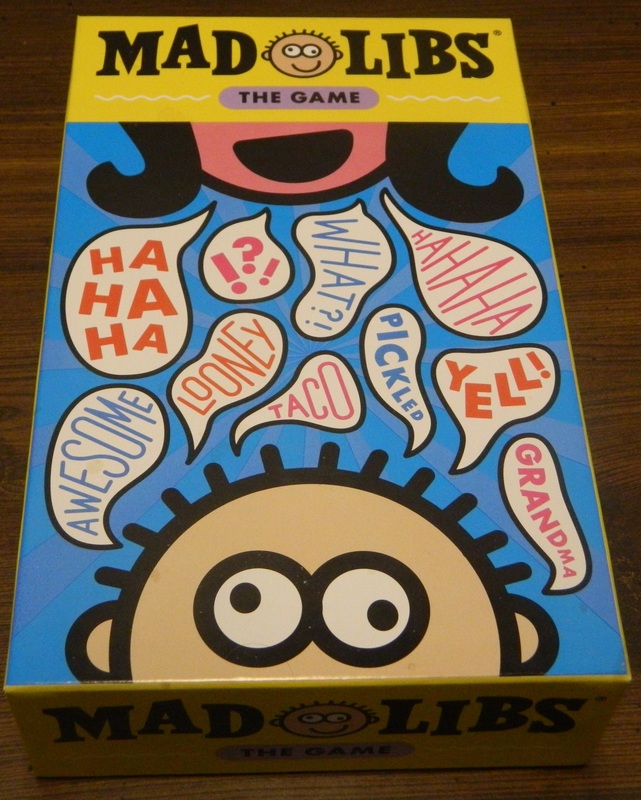 Mad Libs The Game takes the gameplay mechanics popularized by games like Apples to Apples and finds a way to combine it with the classic Mad Libs style of creating wacky sentences. The game is quite fun, easy to play, and is a great family and party experience. The biggest complaint with the game is that there just aren’t enough cards included with the game. You will end up having to use the same cards more often than you would want. If you don’t really like this genre of games or don’t like Mad Libs, Mad Libs The Game might not be for you. If you are a fan of Mad Libs or like games like Apples to Apples though I think you should enjoy Mad Libs The Game. A fun, simple, and quick party game. Does a good job adapting Mad Libs to an Apples to Apples style card game. There will be times when players don't have any cards that work well together.